This unique and important guidebook is a single, comprehensive source of information and advice to help women (and some men) at high risk for breast and for ovarian cancer because of family history and genetic profile. One part memoir, three parts “how to” manual, Positive Results explains in a clear and steady manner the myths and realities of “the breast cancer genes.” It lays out all the options in easy-to-follow, compassionate language. It will help women and men decide if they want to pursue genetic testing, guide them in interpreting their test results, and give them a sound basis for making the life-saving decisions required to manage their risks. 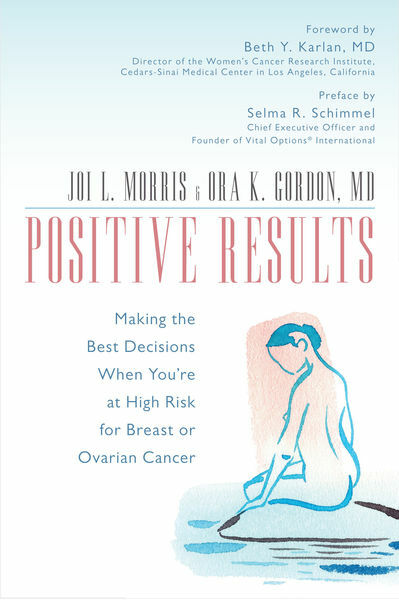 Authors Joi Morris and Dr. Ora Karp Gordon cover all of the latest medical options, including genetic testing for breast cancer risk, breast cancer surveillance, assessing risk, mastectomy and breast reconstruction techniques, ovarian cancer surveillance, surgery, managing menopause, and cancer risks in men who carry mutations on BRCA genes. Along the way, Joi tells her personal story and that of other women and men who have made the gut-wrenching decisions required to survive in this world of astronomical risk. At the age of forty-two, Joi learned that she has a genetic mutation on a gene known as BRCA2. The test results meant that her risk of getting breast cancer could be as high as 84 percent by age seventy, and that her risk for ovarian cancer was also high. Compounding her risk was the fact that her mother had developed breast cancer in her forties. After much research and consultation, the result of which is this book, Joi made the difficult decision of undergoing prophylactic mastectomies. This straightforward and practical approach combined with the poignant personal experience of a woman at risk facing these challenging decisions will provide readers with the feeling that they have had the benefit of a long conversation with both a trusted physician and a friend who has just gone through the same uncertainties they are facing.